Here is another page from my sketchbook on which I recorded a story told to us by our Afrikaans guide. It captured my imagination to think about how a society, so split by racial violence and injustice, could ever come together in peace. And how something small, like traffic courtesy, played a big part in it! This makes me think a lot about the state of things in the USA, with road rage, mass shootings, and our divides over racial and economic and political issues. Maybe we just need to get out of each other's way now and then and think "I see you. I honor you." One of the most magical aspects of having a Zulu guide and a Zulu driver was their wonderful tradition of storytelling. Some of the stories the shared were myths and folktales. Others were explanations of how the people and animals in the nation actually live. One evening we had some down time while the choir rehearsed, and I used that to do a rough sketch of a comic version of my favorite story of the day. 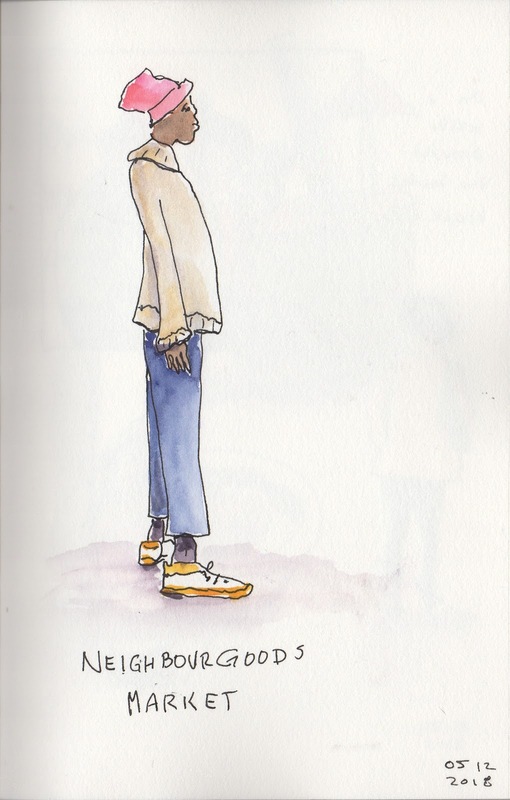 I'm including it not because it's beautiful or even coherent to anyone but me, but as an example of the sort of thing you can put in your sketchbook! Because, remember, it's for you! And there are lots of ways to use those pages to remember the different aspects of your life. 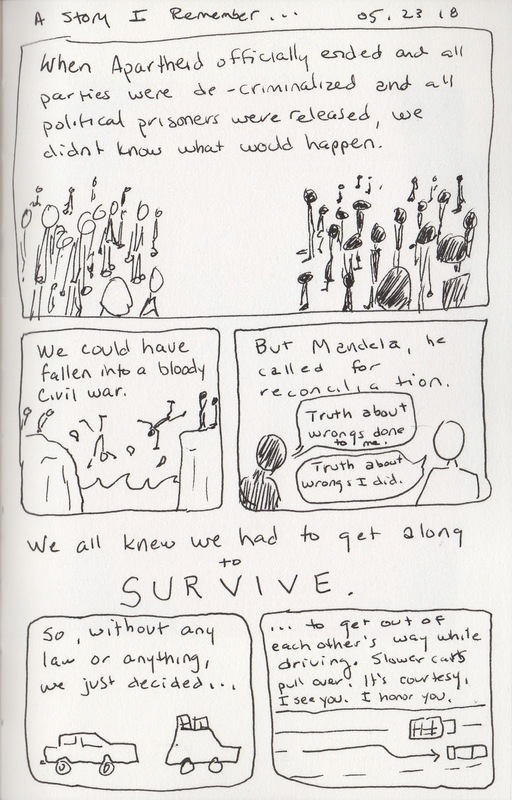 Here's the story I was capturing (which I remember so clearly because I drew it). This is a story about how the wildlife has adapted to life in the giant game reserves which I called "How Lions Use Tarmac to Catch Giraffes." In the game reserves, the lions become very alert when a storm comes in because this means that they can hunt the giraffes. In normal weather, they can't capture giraffes generally, because the giraffes are too big and fast. But when rain comes, the lions gather the pack and run to find a giraffe. Then, as the rain begins, they frighten the giraffe and shift themselves during the chase to drive the giraffe onto one of the hardtop roads of the preserve. The rain makes these roads slick underneath the giraffe's hooves and the tall, leggy animals begin to slip and slide. They lose their speed, and sometimes they completely fall to the ground. This is the change for the lions to pounce and kill their prey. I thought the lions' use of paved roads as a tool for hunting was pretty interesting! On this trip, I did one thing in my sketchbook which I really never do: I drew from photographs. 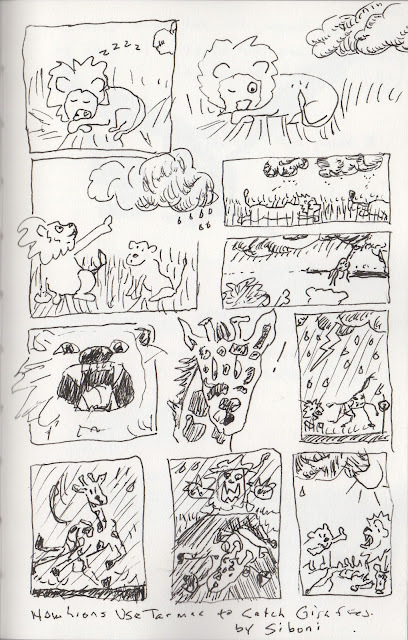 I did this because I wanted to include memories of the animals I had seen which were most impressive to me. But I couldn't draw on a moving safari jeep! 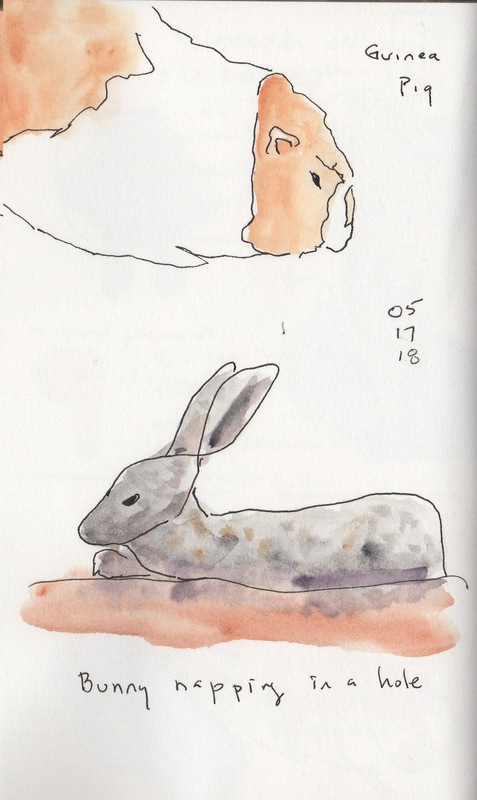 I'm glad I included them in the sketchbook, because this is what I show to people when I talk about my trip, not my photographs! And so these few drawings from photos give me a prompt to share about the cool animals we saw. My favorite was the pack of wild dogs. The guides were beside themselves. Evidently, these are few and rarely seen and we got to see a large group of them. And they moved slowly enough that we got some decent photos. 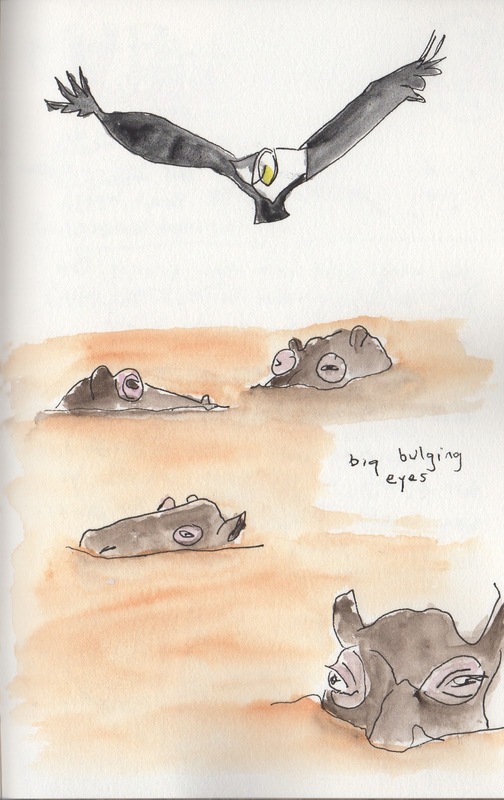 One of our other great experiences learning about this amazing nation was a trip to a hippo reserve... I had hoped to sketch on the slow-moving boat, but it was pouring rain! So I sketched these impressions from photos later in the dry hotel room. 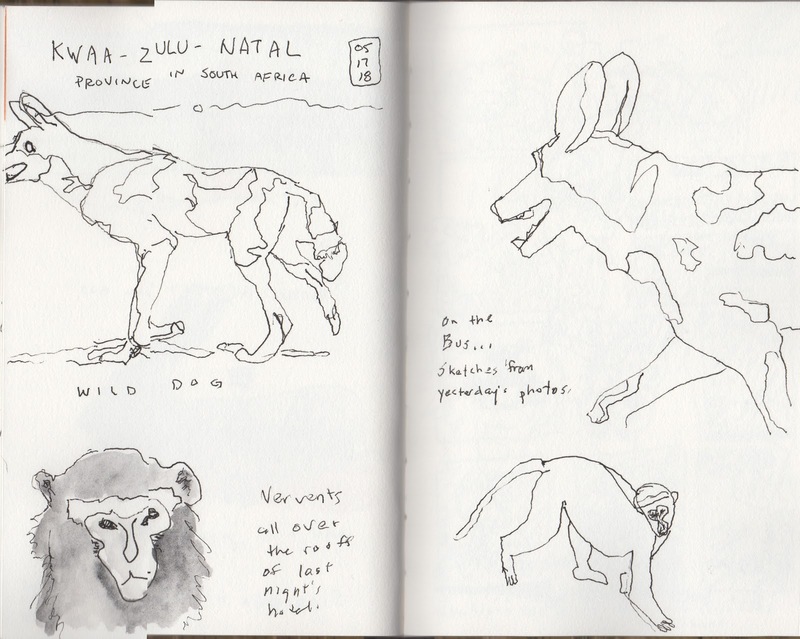 As we traveled, I made a few different kinds of sketches of animals. This first is from the bus. A quick scribble, really, to capture shapes of these amazing birds, many of which were sitting stop gravestones in this vast cemetary. I have no idea what kinds of birds these were or why they chose this spot to congregate. But the image struck me as one to be used in a book or story in the future! 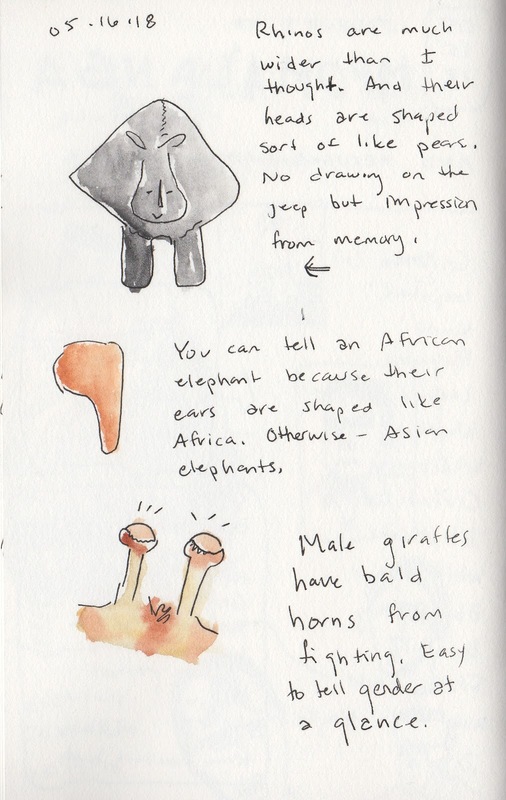 In this next page, I drew basic shapes of animals from memory, in an attempt to illustrate what I had seen and learned while on safari during that day. There was NO way to draw on a moving safari jeep!! One place we stopped for lunch had a large yard (as big as many people's back yards at home in the U.S.) filled with guinea pigs and rabbits. After I finished eating, I dashed out there to draw them from life. Here's an example of a page with a little bit of narrative. What I like about this page is how the three pictures move inward in closeness. A large landscape, a medium "shot" of the trio of singers, and some close-ups of masks for sale at the nearby open air market. While the page doesn't identify all the pieces super clearly, I know exactly what they are. And together, these three different images take me right back to the sights and sounds and human connections of that experience. During my travels to South Africa with the Hope College Chapel Choir in May 2018, we had the enormous privilege of visiting an AME church in Soweto. The welcome we received there was so gracious and loving! 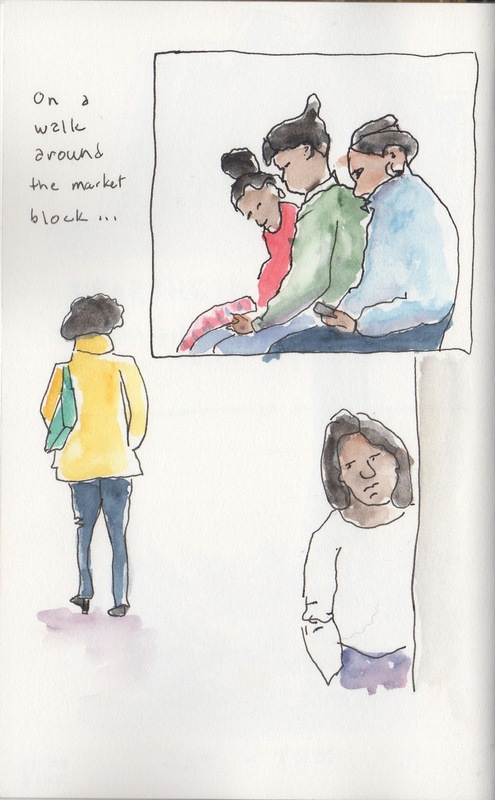 While the choir sang, I had the fun of drawing some of the congregation enjoying the experience. The women were dressed beautifully. People were so happy to have us visit; many recorded the songs on their phones. This lady was terrific fun to watch. 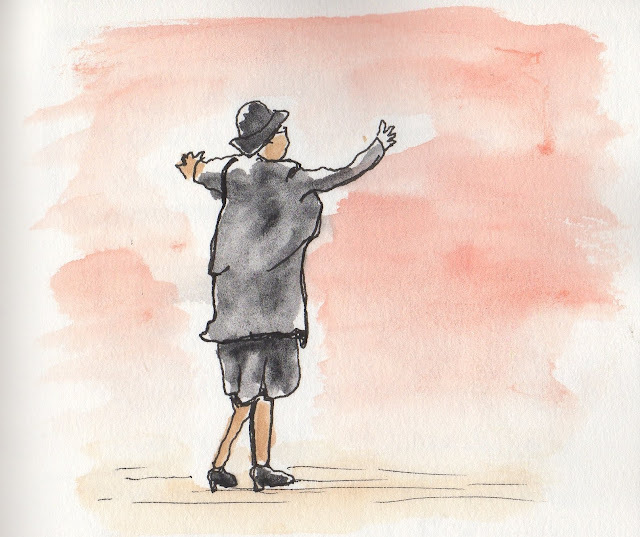 It was clear she was "The Church Lady." Unofficially, she ran the place. You could tell. 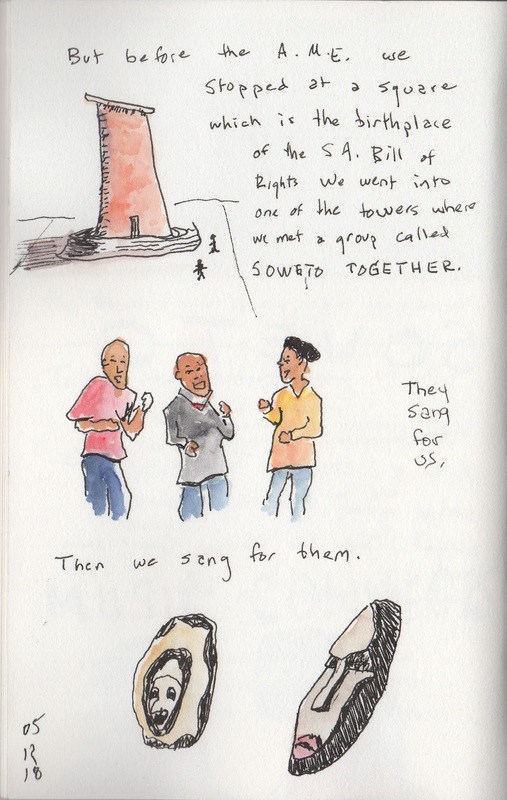 We visited Constitution Hill, the site of a former dreadful prison and of the current constitutional court. The tour was grim and humbling. 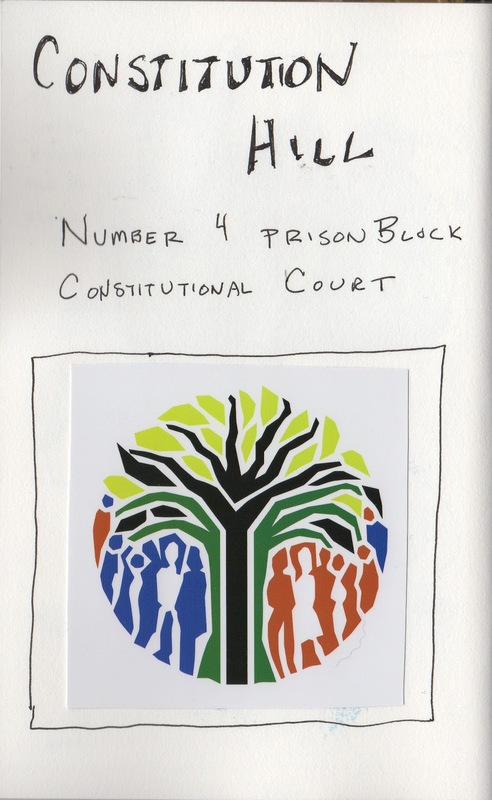 I didn't sketch the cell blocks, the wires, the places of suffering and death. I think I would sketch them if I had more time to be present with them. But the tour moved pretty fast. Then we ended by spending time in the court area, where justice is working much more effectively now. It gives me hope for the world. I'm including this next page as an example of something I did a few times in this sketchbook. Because we were on a tour and I couldn't control the time I needed or wanted to sketch things, I would occasionally stick in an image from a guidebook of something I wanted to remember, and perhaps redraw later. That's what I did here with the symbol of the constitutional court. 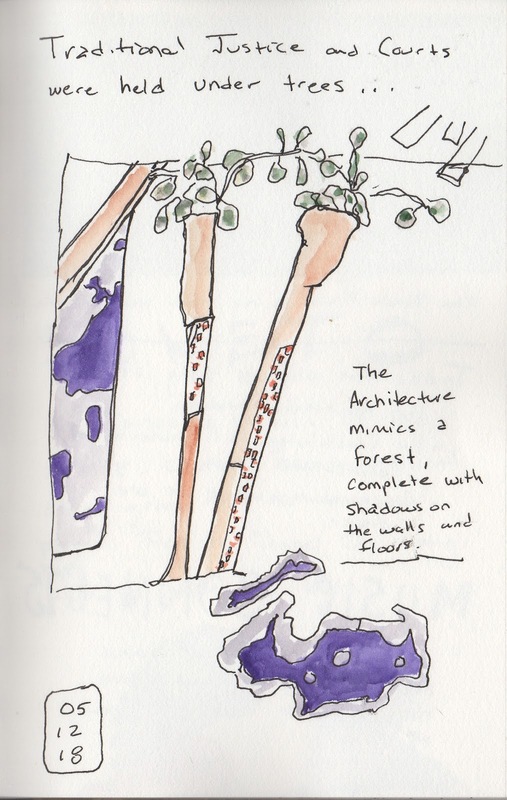 In this next page, I captured some of the amazing designs and colors used in the court room to create the sense of the room itself being a space under a tree. I can't express how much this notion of justice, this honoring of traditional native practices, captivated me. What would America be like if we did this? 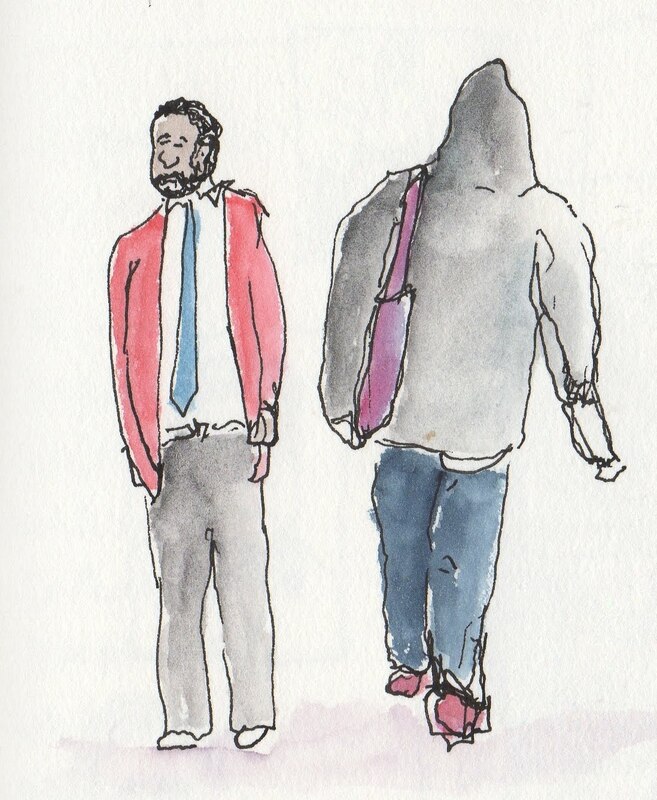 One thing I learned to do while sketching from a moving bus caught in city traffic: draw the people! If the bus is moving very fast and the pedestrians aren't moving very fast, you can nab enough to capture shapes and expressions! This ended up being one of my favorite things to do when we got caught in traffic. And that's one of my favorite things about keeping a sketchbook: I am never bored!